The Project Budget Sheet is the perfect way to plan for the success of a company or business project. Plans falling through or a project going over budget is the biggest fear of a project manager. There can be an upsetting number of elements to a project and if you’re trying to coordinate a monster of a project, there are a number of things that can go wrong. This free project budget was designed to help you break down your project and compartmentalize the different elements associated with it so you can even assign different tasks to “task leaders.” Make your next project as simple as possible by downloading the free Budget Sheet today. Alright, so you have 4 different tabs on the bottom of the page. Each one serves a different function to help you setup your project budget. Start in the “Project Cost” tab and break down your project by tasks. As with the example, you can use the different tables as a way to turn your tasks into separate categories. 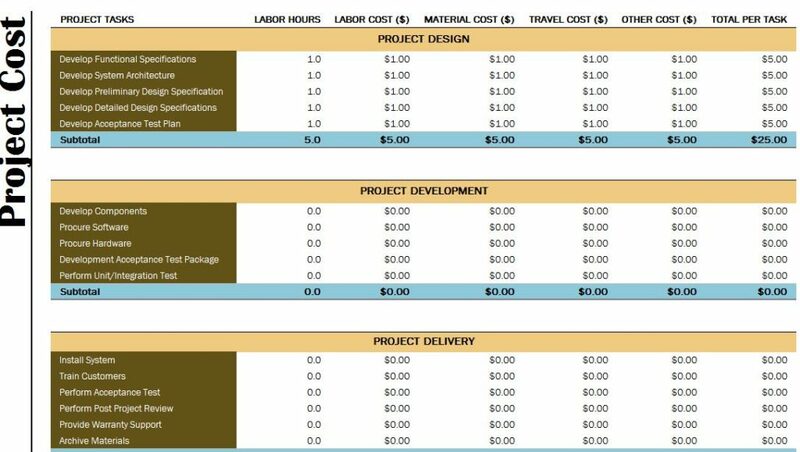 From there, you will estimate the cost for each by using the indicated columns to fill out the cost of labor, material, etc. If you have any expenditures over time, you can separate them from your main list in the “Expenditures Over Time” tab. Just fill them out as they come up in your project. When you have all this information ready to go, simply click on the “Cumulative Projects Costs” to see graphs that illustrate the difference between your projected and actual costs. Now, go to the “Data Worksheet” tab and enter the cost of your items and the projected budget for each month. Depending on the length of your project you can use weeks or months. You would then list the month/week of the project, then the projected cost and the actual costs for both the regular and cumulative months. Now you have everything you need to make the best strategy for a financially successful project and stay on budget.